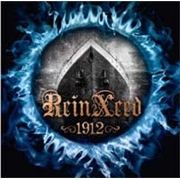 Swedish band REINXEED hails from Boden, and is centered round guitarist/vocalist Tommy ReinXeed. Since 2002 they have been in the business of Adventure metal, there´s new one, all about legends and stories with a twist of heavenly hope. Inspiration comes from GARY MOORE, ANGRA and ROBBIE VALENTINE, a.o. This is album number three, the so called difficult one, let´s see how REINXEED fares. The opener and title track is a fine example of good arrangements and nice choruses. It´s very Swedish in spite of the influences cited. The album is either somewhere in the vicinity of EUROPE, or a mix of SONATA ARCTICA and STRATOVARIUS. They have a penchant for the bombastic that is perhaps a little “more” than most, but they dress it in nice guitar work and enjoyable keyboards. My favorite tracks all have a lot of EUROPE in them, “the slower “Through the Fire” and the somewhat TONT MACALPINE reminiscent “We Must Go Faster”. The problem here is that they often opt for very similar basic rhythms, and the German style polka is sometimes too much. But the general level is quite high, REINXEED does what I wish more bands did, they dare to look at Swedish hard rock´s poodle past, but without relying solely on it. “Reach for the Sky” and “The Fall of Men” are slight let downs, but it is not really bad. So, if you like speedy Germans and a good dose of EOROPE, this is a recommendation.